Very clever and unique! Thanks for sharing this awesome idea. Can't wait to get the new Hero Arts Kit!! Joan what a fabulous post. Your card and envelope box and so unique and I love the blues! Now, who wouldn't just love to receive that in the mail! Beautiful! Both the card and the envelope are gorgeous. Love the new kit with the beautiful dies and stamps and the wonderful watercolors. You have a good reason to feel like an artist because it looks stunning Joan! Love the wonderful blues you used on the flowers! I could never tell that you are uncomfortable with watercolors. 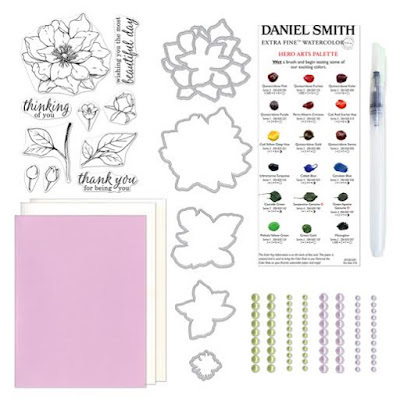 I can hardly wait to try the Daniel Smith watercolors that come in the kit. fantastic idea Joan and love the colors you used! Great job on the card and box! Love your colors! Love what you did with the kit. Very unique! Omigosh...this is so clever and beautiful. Brilliant use of the kit. So pretty! What a clever idea! I had a not so minor cardiac EVENT when I saw this. Breathtaking!!! Clever...my goodness this is a great idea. Smart! Oh my gosh! What a beautiful idea! sigh, it's going to take too long for my kit to arrive! What a clever idea and clean and simple to tuck the flowers behind! Love it! Such cleverness and artistic beauty! Love the card. Very clever idea. Another clever idea. I make boxes such as this ALL the time but never once thought to use water colour paper never mind water colouring it first! Fabulous ideas my dear! Great pair, Joan. They look like something an artist would create! This little gift set turned out amazing!! WOW I love your card - very clever use of those pretty flowers! The box makes it a wonderful gift! Thanks so much for sharing! You sure are an artist---very pretty and this sure would make a great gift!!!! Such a lovely set, Joan! Love the dimension of the blooms on the card and the matching wrapping paper is genius! What a great idea. Love the set. Love your little water colored box! This is a unique card and I love the simplicity with the flowers peeking over the top. The envelope box is just and added surprise. Thanks for sharing. What a pleasant set of card and envelop box!! Your card set is wonderful. Thanks for the inspiration! Wow - love your ideas! Beautiful Card!!! This kit makes me believe that I too can watercolor! Gorgeous, Joan! The box is a work of art in itself! I like your cute decorated box. 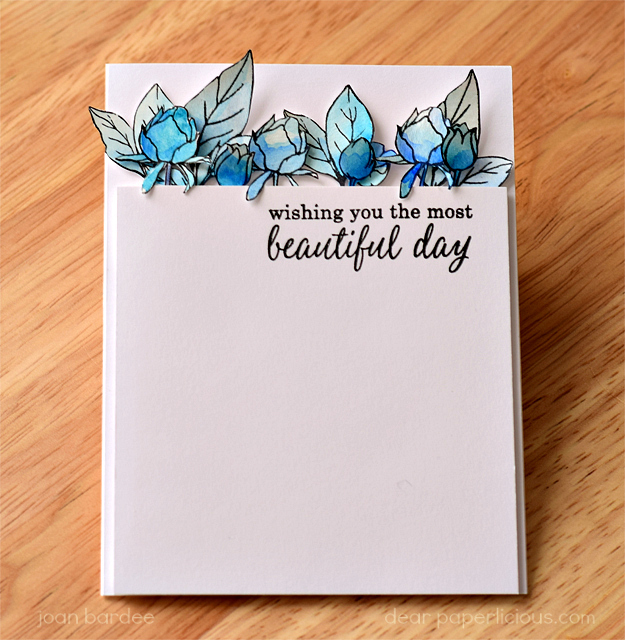 The card is a great way to use the buds in the stamp set. Thanks. So pretty! Love the flowers tucked behind the panel on the card and the gorgeous box is just so much fun! Just gorgeous, Joan! What a treat it would be to get that in the mail. Just gorgeous Joan! Really love the card layout and the box design! Fabulous! Thanks so much for sharing! What a pretty card & love the matching box! What a clever card design, so unexpected, and gorgeous! Nicely done! I would but those envelopes in a store. Favorite stop so far. I love that you shared your mood. We always think our cards are critiqued by others but I have discovered they are not. That makes making them much more fun! This card with matching envelope is nothing short of "cool! I'm gonna try it because of you! You are an artist! Love the florals bursting at the top border of the card. What a wonderful surprise for anyone receiving that gorgeous envelop too. Wow! What a beautiful set!!! Your box is stunning and I LOVE the design of your card! Gorgeousness! This is STUNNING!! 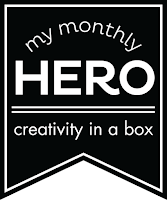 I LOVE the box you created!! Absolutely love your card & envelope box! So, so pretty & the watercolouring is gorgeous. The card and the box are great, I love the flowers behind the paper!! Simply stunning card, a gorgeous idea and the box is beautiful!!! Ooh great idea!! Thanks for sharing how you did this!! Love the blue. This is just awesome. It's a little gift from the heart as well as a card. Lovely use of the kit! Awesome!! Love the idea!! And so excited to try this out!! Lovely card and envelope box! I love the way you painted the envelope box. Love your card and how the flowers look like they're coming out of the card. And the envelope box is awesome! Wow, your card is stunning! I love your delicate rose buds and the envelope is beautiful too. You can't go wrong with blue and white - so, so beautiful! Great idea with the box and your card is wonderful. WOW!! That card and box are GORGEOUS! 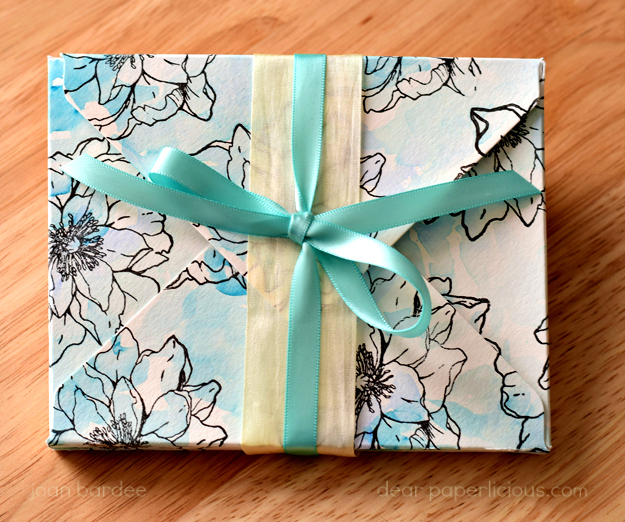 Love the color and the idea of making the box with stamping and watercoloring is soooo creative. Perfect gift. So beautiful! I love this kit more and more on every hop. Your card reminds me of a flower box with the flowers peeking out of the top....very cute. Oh, WOW! Love, love that box! And I didn't know that you can actually peel off the top layer of watercolor paper. Thanks for that tip. I love your card! Such a clever design! TFS! Joan, this is beautiful! I love the envelope! Love how you made the box. Wow - I love the card and the matching box! I may have to try one of those boxes!! Your card and box are beautiful. Thanks for sharing your creativity. Gorgeous card with the tucked in blooms and leaves and the envelope box is gorgeous! Your post made me laugh! Your card is lovely and making a box to preserve it's integrity is genius. Mood when done reading - inspired! Your box is just beautiful. Who needs hallmark? I like the tucked in design and the beautiful envelope. Cute card and lovely box!! Absolutely awesome! Love the simplicity & gorgeous coloring on both the card & the box. Great work!! Fantastic take on the theme. Love the monochromatic colours. Gorgeous ensemble! I love the dimension on the card, and the box is beautiful! Awesome colors! Love your card and envelope box. Such a great idea to showcase April's kit. Oh but you are an artist - it's just gorgeous! I would love to see a video on how you did those flowers! I would so happy to receive this card and envelope! I love the buds on the card and the blooms on the envelope. I love your card gift box! You did a fantastic job. I also like your card and the cute technique! Simply beautiful! Love the flowers tucked in, plus that gorgeous box! Oh gosh! This is my fave creation amongst all! Love that large flower created gorgeous envelop box with such clever and unique design for coordinating card! Great design with those petals and leaves peeking out of the top of the panel and that wrapping paper is just wonderful! Great design. Love the envalop box too. Love your colors. 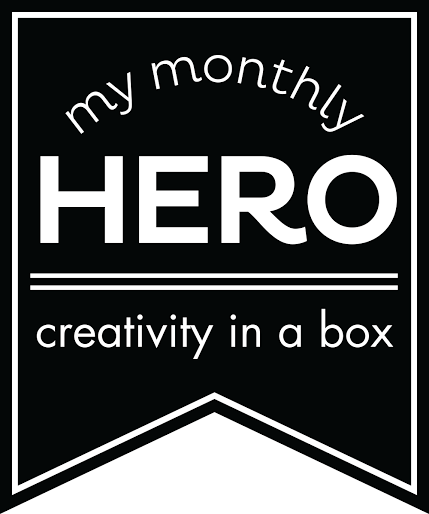 I make boxes and am inspired to decorate them in this manner. Thank you. Wow - the tucked flowers card is super neat. Love the soft blue too. Joan, making my way through the hop...absolutely gorgeous projects! Your card is amazing!! Your custom box is a gift in itself! Lovely work! You created a terrific combination of wrapping paper and card! The card's peeking flowers are fabulous! Love your card and box! Colors are beautiful and I love the flowers overlooking the card! TFS! Oh, my mercy. Can't decide if I love the card or envelope more. You PEELED apart layers of watercolor paper? Didn't even know that was possible. And the results look like you are an artist. You certainly are an artist, as the date and envelope box are so unique and beautiful. Who knew you could peel the paper of its layers? Thanks so much for the technique. The card and envelope box are just beautiful! Thanks for sharing. LOVE the DIY envelopes!! The entire set is gorgeous! Beautiful showcase, Joan! What a unique card - very nice set! Very unique to make the box envelope, and I love your use of the buds! Thanks for sharing. of the card. Looks like a flower box. flatten all of your hard work. thanks for the ideas for this card. Joan, thank you. I loved how you coordinated the cards and box with flowers. Very nice. I love your card and box, both are just lovely! love, love, love how you tucked the flowers in at the top!! fabulous design... gorgeous card!! What a beautiful gift this would make. Anyone would love to receive this! What a lovely card. I like the blue flowers, which appear to be "tucked" in the card. Thanks for hosting this giveaway. I love that box! And the card is beautiful. How awesome your card and box both are. You did such a great job on both. Very nice! Thanks for such a unique design! I love your fussy cutting and matching envelopes! how creative! thank you for inspiring me to think outside of the box. WOW! Two unique projects. Love those little flowers and the envelope box is beautiful. What a great set! Never thought of pulling the watercolor paper apart! That box is super cute! Fabulous card, Joan! How creative to present the flowers like you did! I love it. Thanks so much for sharing this gorgeous card and envelope box with us! Just lovely! Now I need to go back and remind myself how to do the box! Thanks for the reminder. I'd love to see a video of how you did those dainty flowers. I am kind of new to all this and not exactly sure how you would go about it. I didn't know you could peel layers of w/c paper. This is so cute! VERY creative, too! Your card is fun but your box is divine! I love the envelope and the idea of peeling the watercolor paper to make a more delicate flower! Oh wow those buds are stunning just peeking out of the top! And love the box!!! Wow so nice to see a different idea presented. Love the envelope box decorated so beautifully with the flowers. Thank you for sharing! I likebana the decorated envelope too. We forget those many times. Pretty. I like the decorated envelopes; pretty. What a fun way to use those flower bud images by tucking them into the card! Beautiful and so creative. Such beautiful cards, soft but vibrant. Wonderful creation with color & dimension. Have a BEE-utiful day! Awesome projects! Thanks for the card box link too! So, so soft and pretty! Thanks for the inspiration, Joan! You're better than Hallmark! LOL Love the tip about peeling off the top layer of paper for more delicate images. Never knew that! Thank you for sharing!! Ok I have to admit the envelope box is my favorite! Amazing card and Love Love Love the box. Great Job with the watercolor! This is very different from everything else! Love it! The card looks simple, but it's a WOW card and the box is just perfect! Your card is GORGEOUS!!! the envelop box too! Wow! Great release!!!! I love this new kit! And your card and box are absolutely gorgeus!!!! 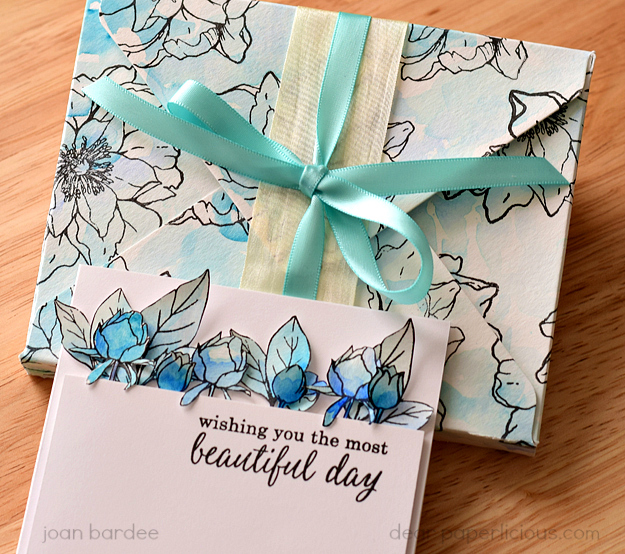 So pretty Joan, I love the colors you picked to use and the box is fun! Beautiful Joan! Love your card and presentation! Fun idea. Your box turned out beautiful. wow, i didn't even think about using it on wrapping paper! Wow love the look of the tucked in flowers. Love your fab card &box!! I'm really loving your take on this... Just using part of the image us genius & gorgeous! I love the box too, of course!